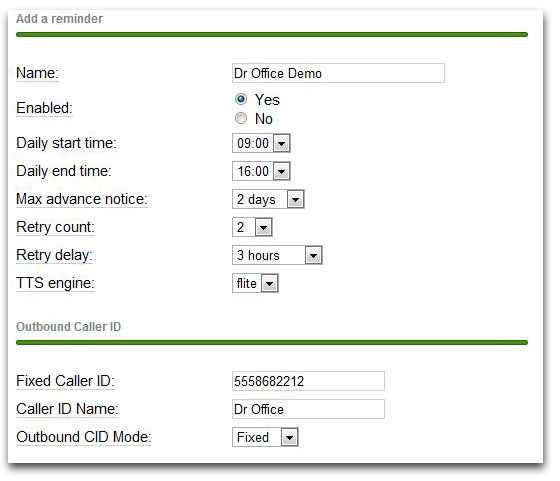 Appointment Reminder Module for VirtualTone is a unique way to automate appointment confirmations, cancellations and reschedules. By simply specifying numbers and names to be called your PBX will automatically call at specified times and allow recipients to confirm / cancel / reschedule appointments. The module gives you the flexibility to control all details of the calls from rate limiting to retry attempts and days ahead to notify of an appointment. You have the ability to simply load a CSV list of numbers to call, or even add numbers and names manually. On the fly modifications can be made to any Appointment Reminder list to allow for total flexibility.